THANK YOU! I really appreciate the acknowledgement! Awesome!! Thanks so much, KitchDesigns! Thank you! like your blog, too. Congratulations on your award! You do have a very cool blog. And Thank You for passing it along to me!!! I will accept this blog award with the utmost of gratitude. I'd like to thank all the people who helped make this a reality. Uh-oh...now I'm becoming verklempt. I'll give you a topic. The thigh master is neither a thigh or a master...discuss. Angie- I didn't think it was possible, but I think I adore you even more after your acceptance speech! 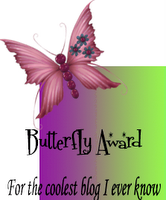 Awww, thanks so much for the blog award - You're so sweet for thinking of me! I love both of your blogs too, I just followed your other blog at Blogger, you are off to a good start! Thanks so much for the award! I'll be passing it along as soon as I get a chance. Very nice. Congratulations. Thank you for sharing this honor! Thanks so much for the award! It's my first one. I'll be passing along as soon as I get a chance...I'm so busy right now working on Christmas stock.